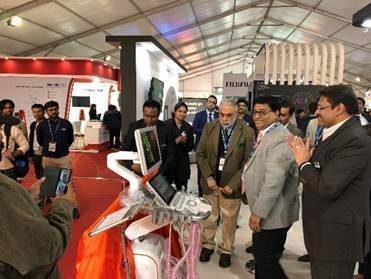 At the 72nd Annual Conference, IRIA, Chandigarh, Siemens Healthineers presented a series of new products and latest technology update at the event. Innovation with MRI, X-ray machine and Ultrasound portfolio, cutting-edge technology with CT scanners, and the powerful AI-based system were showcased at the IRIA 2019 exposition. The products, ACUSON Sequoia and MAGNETOM Lumina were also unveiled at the IRIA; by Dr MS Sandhu, Professor and Head – Department of Radio Diagnosis & Imaging, PGIMER, Chandigarh. Magnetom Lumina is the latest addition to the new portfolio of BioMatrix scanners from Siemens Healthineers and features a 70-cm bore. BioMatrix provides customers with a comprehensive set of innovative MR technologies – technologies that automatically adapt to the patient’s anatomical and physiological characteristics. Biomatrix Technology is the key to making MRI even more consistent and more robust, reducing unwarranted variations in imaging results; and achieving standardised, reproducible results. For radiological examinations, experienced colleagues can “tune in” quickly and in real time via audio or video functions, and connect to other locations seamlessly; saving on time and cost. By ensuring best possible support from experts in any location; high quality and uniformed imaging can be achieved across all the locations desired. It would also help in reducing the number of undesired variations in scan quality, which in turn enables to deliver more accurate and precise radiological diagnosis. Siemens Healthineers has a long history of AI-enriched solutions with over 40 deployments embedded in the imaging modalities and syngo.via AV solutions. AI-Rad Companion is a new dedicated software platform that brings artificial intelligence (AI) to medical imaging. The AI-Rad Companion assists radiologist in reading and reporting. It’s first application, AI-Rad Companion Chest CT, automatically performs measurements, prepares results for reports, highlights and characterises anatomies and abnormalities and in addition to that even creates references with risk scores and reference values. The results may eliminate the step of manual image post-processing on an advanced visualisation device and therefore increase the accuracy in interpretation and reporting. “We are focussed on how digitalisation is helping empower our customers in their journey towards delivering high-value care. Our products and solutions are addressing some of the core challenges faced by our customers; improving patient experience, managing chronic diseases and optimising clinical operations,” said, Vivek Kanade, Executive Director, Siemens Healthineers, India.